Haley Joel Osment and Lily-Rose Melody Depp in TUSK. ©A24 Films. HOLLYWOOD—Audiences always will remember Haley Joel Osment as the kid who saw dead people in “The Sixth Sense.” But little Haley is all grown up and has transitioned from child actor to grown up actor in Hollywood. He currently has a recurring role on the Amazon series “Alpha House,” which is going into its second season. Additionally, he has a major role in Kevin Smith’s dark horror comedy “Tusk,” in which he plays a podcaster whose friend goes missing in Canada, and has to go find him. The story is inspired by an actual podcast that Smith did. The 26-year-old actor recently spoke about working with Kevin Smith and co-star Johnny Depp, who is almost unrecognizable with a false nose in the bizarre film as a French private investigator named Guy LaPointe, who joined the cast because his daughter Lily-Rose is in it alongside her friend Harley Smith, Smith’s daughter. Osment enjoyed the experience on “Tusk” so much that he also returned for Smith’s next feature, “Yoga Hosers,” due out next year. He also appears in the upcoming “Entourage” movie. Stout and unshaven, the veteran performer has a good sense of humor with a hearty laugh that can also be heard as “Tusk” opens with him as Teddy and Justin Long as Wallace riffing on their podcast about a crazy Internet video in which a boy accidentally sawed off his leg, prompting Wallace to head for Canada to interview the kid for the show. Once he arrives, the podcaster is disappointed to discover the youth has committed suicide, killing his story. Not wanting to return to the U.S. empty-handed, Wallace is lured in by an ad offering lodgings in exchange for an old man’s stories about life at sea. When he arrives at the stranger’s remote house, Wallace gets more than the stories he was hoping to gather. 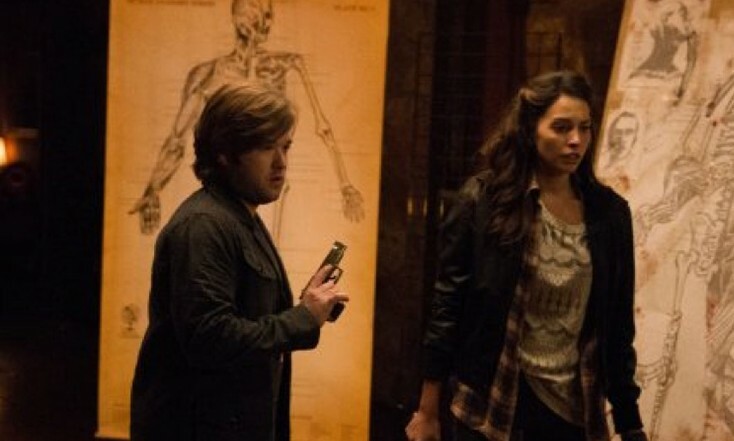 Receiving desperate phone calls, Osment’s Teddy and Wallace’s girlfriend Allison (Genesis Rodriguez), go in search of their missing friend. In their quest, they meet up with the oddball P.I. LaPointe. With LaPointe’s help, they soon track down their friend, who has undergone a horrifying transformation. Q: We all remember you from “The Sixth Sense.” How has the transition been from being a child actor to an adult actor been? Osment: As an actor, I feel really lucky because I’ve been lucky enough to have had a lot of experience on sets and still be relatively young. It’s fun because you’re body is kind of your instrument and if you’re getting old over a period of time, just remembering doing these characters when I was a kid and now being an adult and having a romantic interest (in “Tusk”) and things like that. The variety is really exciting so I guess I feel lucky. Q: Can you talk about working with the breakout star Guy LaPointe, who is actually Johnny Depp? Osment: Ah, yes, the famous Canadian actor, Guy LaPointe. (He laughs.) I think when Kevin (Smith) got in contact with him, he responded immediately, saying, “Oh, this sounds like something I’d want to swim around in.” That certainly was the feeling we got on set—that he obviously is a chameleon and really good at stepping into other roles. With this one, he got to have a lot of fun and act with cinema legend Michael Parks, which is kind of cool. Q: How was it working with Johnny Depp? Did you get to interact with him a lot? What was it like working with Michael Parks, who plays the crazy old man? 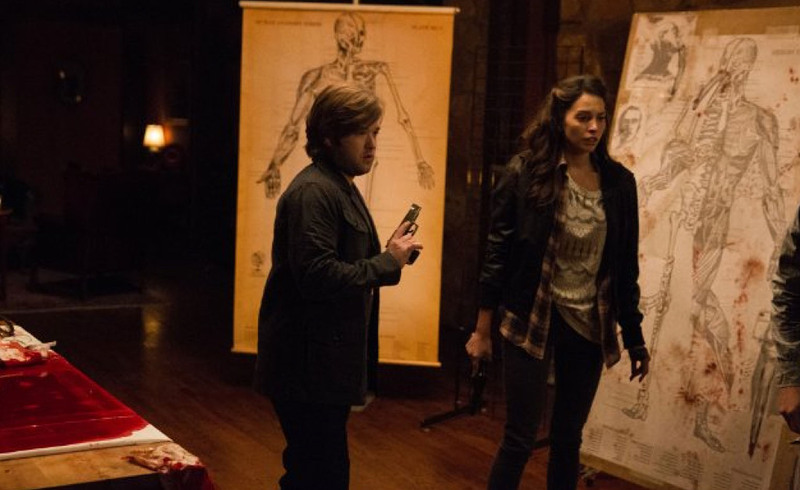 Osment: Luckily, we already were (on-set). Most of Johnny’s stuff is with us, which was kind of cool. And, yeah, we were trying to see as much of Michael as we could. Q: Johnny’s daughter, Lily-Rose Depp, has a small part in the Canadian convenience store scene. What was it like watching her act opposite her father? Was it weird? Q: You do a lot of stupid things with your buddy Justin in this film. Do you have a guy friend like that in real life? Osment: You certainly go into your own friendships to try and map out what it would be like with those two guys and everything. Some of my high school friends, whom I’m still friends with, there is that thing where you develop your own language with each other. What’s interesting about these two characters (in “Tusk”) is that their podcast is their own special relationship, but then it gets broadcast to millions of people and becomes a sort of currency for their fans and everything. Q: What was your reaction to seeing Justin Long in the walrus costume? Osment: Luckily, we didn’t see too much of him until the scene where he is revealed to us, without giving too much away. We just saw like pieces of the walrus creature being carried around, sort of like what the audience gets, where you sort of gradually get a full picture of it. But I certainly got a full dose of Justin and his mustache, which was a good look for him. Q: Did you have walrus-suit envy? Osment: No. (He laughs.) He’ll tell you, it was so uncomfortable to be in that thing. I think Kevin said it was like being on the Hoppity-Hop thing, the big balloon thing that you hop on as a kid, but then being inside the suit and having to shuffle around. It looked really uncomfortable. Q: Did Kevin Smith give you a lot of direction? Osment: The writing was so good that the characters were clear. Then he kind of does this cool thing where once he got to know us on set, he generated material based on just starting to know us more. Then, he wrote that great monologue for Genesis (Rodriguez) and the extended podcasting scene for Justin and me. He’ll answer any question you ask him, but his big thing was always saying, “Oh, remember to have fun,” and stuff like that. It isn’t someone saying, “Hey, remember to get this part of the character,” or something. He trusts his actors to do that. Q: You shot Kevin’s sort-of sequel to this: “Yoga Hosers.” Are you playing the same character in that? Osment: No, but it’s the same county. It’s just (Rodriguez), me and Johnny, who I get directions from at one point. I’m a Nazi in the 30’s. It’s really neat, but Johnny plays the same character (Guy LaPointe) and the clerks (Lily-Rose Depp and Harley Quinn Smith) play the same characters. Q: Did you improvise the podcast scene? Osment: It was like improv on the way to that start of the scene, because it starts with us cracking up. That was the day where Kevin came in with 15 or 20 pages of new rapid-fire dialogue back and forth with Justin and me. So we were studying our lines really intensely and then saying like, “All right, have you seen this funny video? Have you seen this funny video?” It was like we were trying to get kind of giggly and up to that point. Luckily, Justin’s an easy guy to get along with so we got to that point where the laughter was real. Q: There are some really fun jabs at Canada in this film. Are you worried about working there now? That they’re going to hate you? Osment: No, we made it to their faces in Toronto. They are loving jabs. I mean all of us have worked in Canada. Toronto was so welcoming to this film, more than we could have expected. I think it all comes from Kevin’s love of Canada and sort of obsession with Canadian culture. Osment: I’ll be finishing up a show called “Alpha House” on Amazon that I love doing. It has a wonderful cast. And then—I can’t announce it officially yet but—I might be doing a film in Colombia in October. We’ll see. I’ll have to grow the beard back. I had it out for “Tusk.” I shaved it to the Hitler thing for “Yoga Hosers,” and now I have to grow it all back.